I originally had a few sightings of this animal(s?) back in June 2017 when I was walking my dog on the trails behind our house in Cambridge, Ontario. There is a ravine there with a loose wire fence around it. I actually think I saw 2 different ones in the same area on 2 different days, but this one, which I refer to as number 2, appeared to have different ear structure than the first one I saw a couple of days before it. My thought is that the "2" had mated and had a litter there, because "both" seemed quite protective. I was originally able to get very poor quality photos of "number 2" a couple days after my second sighting. I didn't see anything the rest of the summer, so I assumed it (they?) moved on. Then, to my surprise, I saw the first one - number 1, again last Wednesday. It appeared to me to be similar to the "first one" I saw back in June. Again, it was quite protective. It was hiding in the weeds and when it realized that I saw it, it jumped up and ran about 60 feet away, turned and stared at me - quite disconcerting. However, determined to document it, I continued to walk my dog (fortunately, because of the dip in the landscape, he never sees anything) along the trail. I always stop at the ravine to see if there is anything there. It's very difficult to see them when they're lying down because the growth is quite dense. Tonight however, around 5:30 p.m. I did notice an anomaly hiding in the weeds. It is "number 2", looking much healthier than it did in June. This time, it wasn't acting protective. It appeared to know I was watching it. After about a minute, it got up, stretched and walked up into the woods, looking at me periodically. 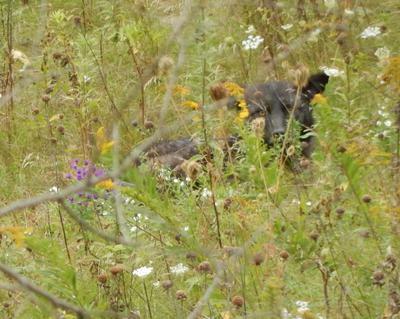 Is it a wolf or a wolf-coyote cross? I would guess it to be around 100 lbs. +. I've attached the best photos I have. 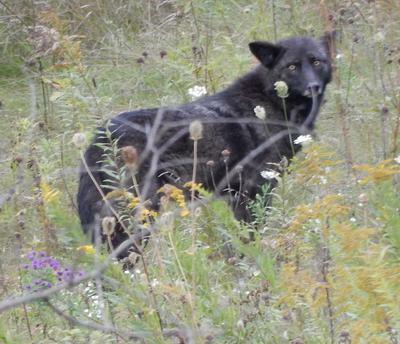 Thank you for this report of your sightings, this is very interesting and perhaps one of our readers will know whether these animals are Wolves, Coyotes or Coy-Wolf hybrids. My apologies for the delay in publishing your report. Comments for Is this a Wolf? 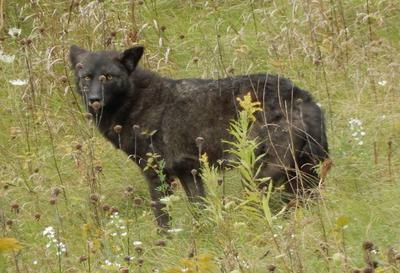 This is a coywolf - a cross between a coyote and wolf. My brother worked as a trapper for the Ministry (of Natural Resources) and tracked a number of coywolf families throughout the ravine system. That was always my thought as well. She's moved on now, but I have had sightings of other "wild dogs". 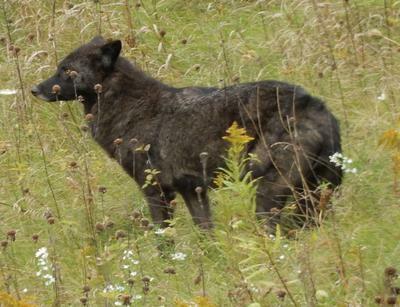 Sure that one was a Wolf (a female, possibly in heat, following me and my dog very early one morning). I also saw what was definitely a Coyote another morning. With a long thick tail & jaw longer, to me looks like a coywolf.